Many short peptides have proved to exhibit potential anti-hypertensive activity through the inhibition of the Angiotensin I-converting enzyme (ACE) activity and the regulation of blood pressure. However, the traditional experimental screening method for ACE inhibitory peptides is time consuming and costly, accompanied with the limitations as incomplete hydrolysis and peptides loss during purification process. Virtual methods with the aid of computer can break such bottle-neck of experimental work. In this study, an attempt was made to establish a library of di- and tri-peptides derived from proteins of Phascolosoma esculenta, a kind of seafood, through BIOPEP (http://www.uwm.edu.pl/biochemia/index.php/pl/biopep), and to screen highly active ACE inhibitory peptides by molecular docking with the help of LibDock module of Discovery Studio 3.5 software. Two hundred and eighty four (284) di- and tri-peptides, derived from P. esculenta proteins after a virtual hydrolysis with pepsin, trypsin and a mixture of pepsin and trypsin, were predicted to possess ACE inhibitory activity, among which there are 99 ACE inhibitory peptides with estimated IC50 less than 50 μM. Nine peptides were synthesized for the comparison between the estimated and the experimentally determined IC50. The results indicated that errors between the estimated and measured log(1/IC50) are all less than 1.0 unit. Virtual method for peptide library construction and ACE inhibitory peptides screening efficiently demonstrated that P. esculenta proteins are prospect resource for food-origin ACE inhibitory peptide. Hypertension is a worldwide health problem, the prevalence of which have affected up to 30% of the adult population according to the World Health Organization. Hypertension carries a high-risk factor for arteriosclerosis, myocardial infarction, and end-stage renal disease ,. It is predicted that by 2025, about 20% of the world population will suffer from hypertension . Although the cause of hypertension currently cannot be well determined, it is understood that the renin-angiotensin system regulates an organism's water, electrolytes, and blood, and the angiotensin I-converting enzyme (ACE) (peptidyldipeptide hydrolase, EC 3.4.15.1) plays an important role in regulating the blood pressure . ACE is a hypertension-responsible glycoprotein distributed in vascular endothelial, absorptive epithelial, and male germinal cells ,. ACE cleaves the carboxyl terminal His-Leu dipeptide from inactive decapeptide angiotensin I to active angiotensin II, a powerful vasoconstrictor which can trigger hypertension -. ACE also influences the kallikrein-kinin system by promoting the degradation and inactivation of bradykinin, which can lead to reduction of hypertension. Therefore, excessive activity of ACE leads to hypertension. Molecules which can inhibit the activity of ACE are considered useful drugs for hypertension management . Currently, synthetic ACE inhibitors, such as captopril, enalapril and lisinopril, are available on the market ; however, they tend to have side effects . Since the discovery of the first anti-hypertensive peptide in snake venom , more attention has been paid to natural sources, especially peptides. Peptides derived from cheese whey , fermented milk , mushroom , soy bean ,, corn gluten , insect protein , peanut flour , and egg  have been proven to inhibit the activity of ACE. However, few studies were reported about their side effects ,. Nutritionists claim that peptides found in food are safer than ‘traditional’ drugs, and they are promising synthetic drug substitutes . Among the ACE inhibitory peptides, shorter ones (di- and tri-peptides) usually have significant advantages over longer ones. They easily pass through blood circulation system , and then reach action sites faster without being hydrolyzed by digestive enzymes during the gastrointestinal digestion ,. For these reasons, the present study focused on di- and tri-peptides. The discovery of ACE inhibitory peptides with potential anti-hypertensive effect is mostly based on experiments, which require amounts of labors and funds. Besides, the possible active peptides can not be totally harvested due to the incomplete hydrolysis and peptides loss in the purification by the experimental protocols. Recently, as the computation simulation technology for drug design and discovery of molecular interaction are booming, the virtual screening or in silico experiment may replace the traditionally experimental screening of anti-hypertensive peptides to some extent. Computational approaches, which are based on computational evaluation of interactions between receptor and ligand, are proved feasible for virtual screening . Molecular docking is a powerful and a widely used tool in molecular simulation, which is approximated to a lock-and-key process. The docking protocol is to ‘dock’ a ligand into an active site of a receptor; then, the interactions between them were ‘scored’ to assess the potential bioactivity of candidate compounds. The most advantage of docking is its high-throughput screening in short time with little cost . In this study, an attempt was made to investigate the ACE inhibitory activity of di- and tri-peptides derived from Phascolosoma esculenta, a marine deposit-feeding benthonic invertebrates, also a traditional seafood with over 70% protein (dry weight) in Southeast China ,. Database of di- and tri-peptides derived from P. esculenta were established, and their ACE inhibitory activities were predicted by virtual hydrolysis and screening method. Finally, di- and tri-peptides which have obvious ACE inhibitory activity were synthesized for verifying the validity of such virtual strategy. There are 22 proteins of P. esculenta with the protein messages including entry name and sequence obtained from UniProt (http://www.uniprot.org/) (Table 1). They were used as original materials for database of di- and tri-peptides. With the help of BIOPEP (http://www.uwm.edu.pl/biochemia/index.php/pl/biopep), the 22 proteins were virtually hydrolyzed with pepsin, trypsin, and a mixture of pepsin and trypsin. MW molecular weight, PI isoelectric point. where IC50 is 50% inhibitory concentration (in μM) towards ACE. According to the LibDock score, ACE inhibitory activity of ligands could be estimated. ACE was used as receptor in docking simulation, whose crystal structures was available in the Protein Data Bank (PDB) (http://www.pdb.org), from where the three-dimensional structure of ACE was imported [PDB:1O8A]. Before the docking procedure, water molecules were removed and zinc ions were retained. The 284 di- and tri-peptides derived from P. esculenta were used as ligands, of which structures and energies were generated with ChemBioDraw software  and minimized with the CHARMM program , respectively. Parameters used in the docking process are shown in Table 2. Five tri-peptides (GYF, WAL, AYF, GLR, and ILK) and four di-peptides (FK, QF, EL, and HK) generated through in silico hydrolysis of P. esculenta protein, with purity of 95%, were synthesized by GL Biochem Co. Ltd. (Shanghai, China) for IC50 testing. where Ainhibitor is the absorbance with ACE, HHL, and sample, and Acontrol is the absorbance of hippuric acid (HA) with ACE and HHL without the sample. Dose-dependent ACE inhibition was investigated using at least five different concentrations of peptides. The concentration of peptides that inhibited ACE activity by 50% (IC50) was calculated using a non-linear regression from a plot of ACE inhibition versus sample concentrations. The chemical properties of C-terminal and N-terminal amino acids of 99 peptides with estimated IC50 less than 50 μM were summarized to deduce the structural-active relationship of ACE inhibitory peptides. Pepsin, trypsin, and the mixture of pepsin and trypsin were used to virtually hydrolyze the 22 proteins from P. esculenta, with the help of BIOPEP (http://www.uwm.edu.pl/biochemia/index.php/pl/biopep). In total, 2,667 peptides were virtually produced, and among them, 1,084 were di- and tri-peptides, which accounted for about 40.6% (Figure 1). After excluding the repeated ones, there were 1,017 non-repeated peptides, among which 284 were di- and tri-peptides. The sequences and the frequencies of these 284 short peptides are shown in Table 3. These 284 peptides were used as the ligands for docking experiment with ACE. Length distribution of peptides derived from P. esculenta proteins by virtual hydrolysis. The enzymes used in virtual hydrolysis are pepsin, trypsin, and a mixture of pepsin and trypsin. The enzymes used in virtual hydrolysis are pepsin, trypsin, and a mixture of pepsin and trypsin. The estimated ACE inhibitory IC50 of the 284 di- and tri-peptides derived from P. esculenta proteins were obtained according to LibDock scores, which were summarized in Figure 2. Ninety-nine (99) peptides had an estimated IC50 less than 50 μM (34.9% of 284 peptides), 100 peptides had an estimated IC50 between 50 and 100 μM (35.2% of 284 peptides), and 37 peptides had an estimated IC50 less than 500 μM, accounting for 13.0%. Most reported ACE inhibitory peptides with IC50 less than 100 μM showed potent in vivo anti-hypertensive activity . Therefore, P. esculenta is a prospective anti-hypertensive peptide-containing resource since more than two thirds di- and tri-peptides theoretically possess obvious ACE inhibitory activity. The sequences and estimated IC50 of di- and tri-peptides with estimated IC50 less than 50 μM are shown in Table 4. Distribution of estimated IC 50 of di- and tri-peptides with ACE inhibitory activity. The peptides were derived from P. esculenta proteins. All IC50 values were predicted by LibDock scores according to the equation, LibDock score = 10.063 log(1/IC50) + 68.08. Short peptides were usually used for predicting potent ACE inhibitory activity. Pripp docked 58 di-peptides into protein target using the Molegro Virtual Docker version 1.1.1 software and found significant relationship between docking results and experimental IC50 values . Several tri-peptides consisting of I or L and positive charged amino acids and aromatic amino acids were synthesized, and their ACE inhibitory activities were measured to clarify the amino acid sequence for inhibition of ACE . Larger peptides, for instance, the sequence length more than 5, were also focused in some work ; however, such works were reported with lower R2 (coefficient of variation) because of the complexity in the modeling due to the bigger peptide ,. In order to confirm the validity of virtual screening method of the present work, nine peptides were synthesized for IC50 testing. The sequences of these peptides were obtained from P. esculenta protein through virtual hydrolysis and screening by docking experiments. 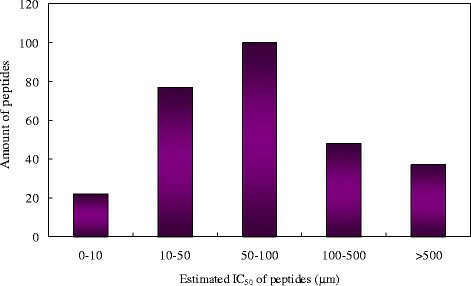 The estimated log(1/IC50) and measured log(1/IC50) of the nine peptides were compared (Table 5). The error between the estimated log(1/IC50) and measured log(1/IC50) is less than 1.0 unit. Desirable limit for model is that the error between estimated log(1/IC50) and measured log(1/IC50) is less than 1.5 units . A reported quantitative structure-activity relationship (QSAR) model was constructed on 168 di-peptides and 140 tri-peptides collected from literatures, and the model verification was made on seven reported di-peptides and tri-peptides (not included in 168 di-peptides and 140 tri-peptides), of which the error was between 0.07 and 1.39 . On the ground of such criterion, the present model is efficient and credible. Previous studies suggested that the structural-active relationship of ACE inhibitory peptides largely depended on their amino acid composition, sequence, and configuration, though the full mechanism of interaction between peptides and ACE is not established so far ,. For the short peptides as di- and tri-peptides, the amino acid composition and configuration are more significant. The di- and tri-peptides which have an estimated IC50 within 50 μM were used to study the structural-active relationship of these ACE inhibitors. There are four kinds of C-terminal residues for 99 sequences (Figure 3) due to the cutting specificity of pepsin and trypsin. Leu and Phe are C-terminal residues formed by pepsin hydrolysis, and C-terminal Lys and Arg are formed by trypsin reaction. Hydrophobic C-terminal (Phe and Leu) is dominant in amount and accounts for more than 80% peptides (44.4% and 36.4%, respectively). There are some accepted concepts about the structure-activity relationship of ACE inhibitory peptides, such as that peptides with hydrophobic amino acid in C-terminus showed a highly potent ACE inhibitory activity . Highly active peptide in general should be composed of large, hydrophobic, and aromatic amino acid with a polar functional group in C-terminus ; and the physicochemical attributes of amino acids such as hydrophobicity, bulkiness, and electronic properties had impacts on the bioactivity of peptides . Accordingly, benzene ring in Phe can also increase the bulkiness and bring about the stability of binding between ACE and peptide and sequentially result in high ACE inhibitory activity. Proportions of C-terminal amino acids for di- and tri-peptides with estimated IC 50 less than 50 μM. 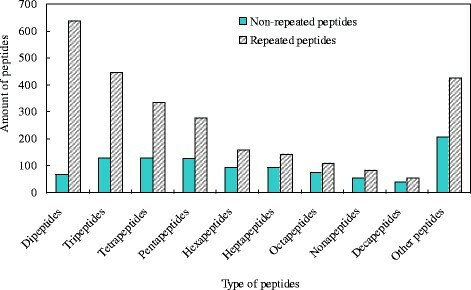 There are 40 peptides among 99 peptides (40.4%) with hydrophobic amino acid at N-terminal, 38 peptides with neutral amino acid at N-terminal (38.4%), and 21.9% peptides with positively or negatively charged amino acid at N-terminal (Figure 4). N-terminal amino acid of ACE inhibitory peptides also favors the hydrophobic interactions with ACE ,. The peptides with hydrophobic amino acid at N-terminal showing higher ACE inhibitory activity have some superiority in amount in the present study, which verified such view. Proportions of N-terminal amino acids for di- and tri-peptides with estimated IC 50 less than 50 μM. A virtual method of hydrolysis and screening of ACE inhibitory peptides with high activity such as IC50 value < 50 μM was constructed in this work. 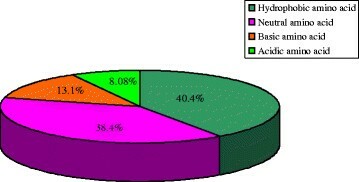 Ninety-nine (99) peptides were obtained from 22 proteins of P. esculenta. Besides, the efficiency and the validity of such method were verified by comparing the predicted IC50 and measured IC50 of some synthesized peptides among the 99 peptides. The results demonstrated that the virtual hydrolysis and screening method is an efficient way that greatly cuts down the experimental labor to get highly active ACE inhibitory peptides. Moreover, P. esculenta proteins were proved as a good resource of ACE inhibitory peptides, which could be a beneficial ingredient for functional foods or pharmaceuticals against hypertension. Further research on larger anti-hypertension peptides derived from P. esculenta and in vivo activity testing will be carried out. This work was supported by ‘National Natural Science Foundation of China (No. 31301413)’, ‘National Major Science and Technology Projects of China (No. 2012ZX09304009)’, and the ‘Fundamental Research Funds for the Central Universities’, People's Republic of China. YL carried out the establishment of pool of di- and tri-peptides derived from P. esculenta proteins and molecular docking experiments. MG carried out the measurement of ACE inhibitory activity. JX designed the study and revised the manuscript. 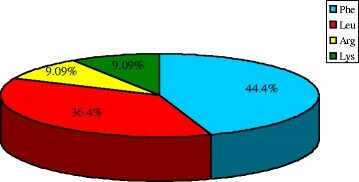 HW performed the statistical analysis and partly revised the manuscript. LZ participated in part of the method establishment. DW conceived of the study and participated in the design and coordination. All authors read and approved the final manuscript.